Summer is in full swing which means... I 'm not cooking! Well, baking actually. It is usually boiling hot in the house by now and the thought of turning the stove on for longer than it takes to pre-heat makes me break out in a rash. This year has been something of an exception. The constant rain we have been having has flooded neighborhoods, condemned local parks and provided a breeding wonderland for the little blood suckers that like to plague us this time of year but... it has also kept the temperatures cooler which means that the AC isn't doing battle with the sun as much as it is trying to keep our carpets from feeling soggy. Now, to be fair, I do some baking in the Summer... in my garage. Silly, I know. But I think it helps keep our house cooler. Preheat oven to 375 degrees. In medium bowl, combine flour, 3/4 C. sugar, baking powder, salt and cinnamon. Add egg and mix with fork until mixture resembles coarse crumbs. Set aside. 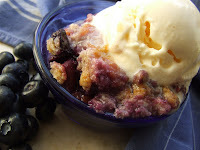 Place peaches and blueberries in large bowl and toss to coat with the remaining 2 Tbl. sugar. Place fruit mixture in greased 8 or 9 inch square baking pan and sprinkle with crumb mixture. Drizzle with butter. Bake 35-40 minutes or until top is lightly browned. Enjoy warm, cooled or chilled. Sarah is our hostess for this fair. 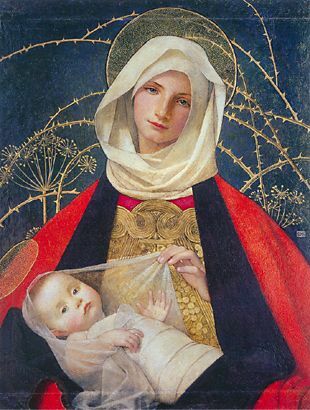 Please be sure to stop by on July 9th to read all of the deliciously delightful contributions. I just have to say... that was the most wonderful Crisp I think I have ever had... you totally rocked the dessert table last night with this loveliness! Seriously, you are going to be on dessert duty for all our potlucks :-)!!! Sounds very yummy. My mother used to make peach cobbler with peaches from our own fruit trees. (Forget Georgia and Texas, California peaches are the best!) Sometimes we would have it for dessert, and sometimes we would have it for breakfast. Then we would take the leftovers and pour milk over them and eat them like a bowl of cereal. You are too cool to think of cooking in the garage! LOL! 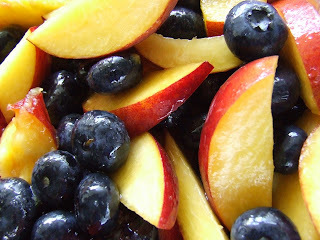 BTW, peaches and blueberries are two of my favorite fruits, yum! Never heard of cooking in the garage before, but I really like the idea. (We don't have a garage though....LOL) I plan to try your recipe! My kids love fruit. We live near the Amish - and many of them have stoves on their front porches to cook on during the summer. Your recipe looks wonderful. I've copied it to try soon! This looks great! One question: the ingredients list says 3/4 C sugar and the directions say to use 1/4 C. Which is correct? You can tell I'm not an expert here, as I would probably be able to figure it out... Thanks! Thanks Heather. The ingredient list is right. You use 3/4 C. sugar in the topping mixture and sprinkle 2 Tbl. on the fruit.